Need some more article ideas for your blog? If its a fresh new blog, its normally not a problem. You can probably sit down and brainstorm 10 articles you wanted to write about even before the wordpress site was installed. Now that the site is up and running and Google Analytics is tracking hits (you did install Google analytics right?… With search console yeah? )… what now? You can pull out your favorite keyword tool and keep finding new keywords, however here is a free way to write about content you are already listing on Google for, and see if you can’t optimize it better. The great thing about this, is that it gives you great long hanging fruit keywords that you are “already” ranking for but haven’t addressed specifically in an article. Where to get this data? 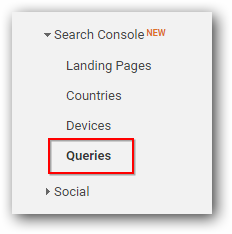 First login into GA and go to the search console and click on queries. What you get is simply amazing. 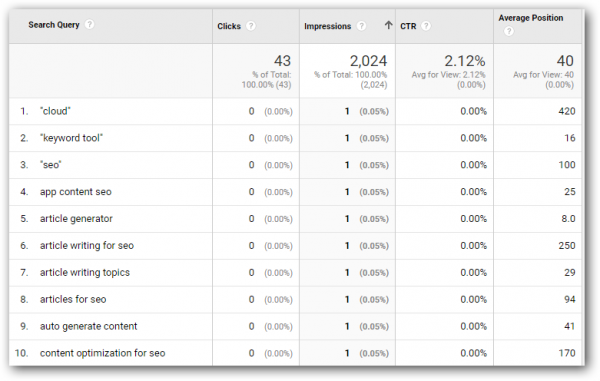 So you get a massive list of inbound keywords you are ranking for. To get the most out of this list click on the impressions table header and sort by impressions to see Google is showing your posts for. Ignore the CTR and position report, its just there to distract you. The search query is the gold mine. The best part of course is that, the more posts you write, the more impressions you will get. This is a slow strategy to growth, but one that is free and rock solid. What do I do with the keyword now? I head over to the app at http://app.articleinsights.com enter the keyword to see how to optimize my content for search and away I go. 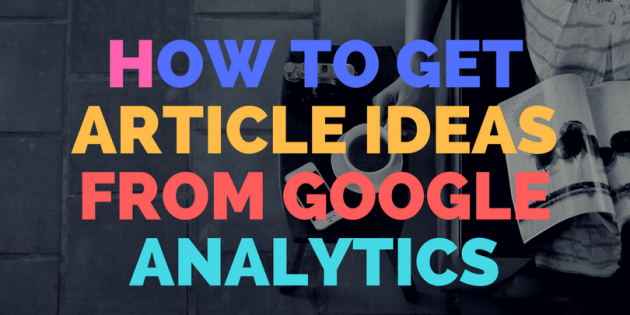 Why use Article Insights? 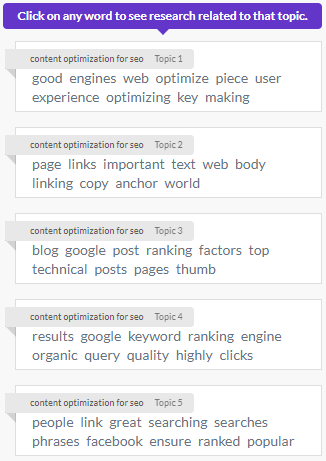 Simple, even with just a keyword eg “content optimization for seo”, its hard to know exactly what I should write about and more specifically what users/google are looking for specifically. Step 1 is to check what the related keywords to this article will be. So I run the search and this is what I get. blog = overwhelmingly its most likely users are optimizing for their blog vs their eCommerce shop or facebook page etc. title post text = we should talk about at least how titles + post text makes part of optimization for seo. Then if I can click on each of those keywords to see what content lies behind it. links seems like an interesting keyword. What role does links play? Since we are all used to thinking about “link building” as distinct from “content optimization” when optimizing for SEO. Here is what the research module tells us. Ok, it means “internal links” are important to consider when creating content on your blog. 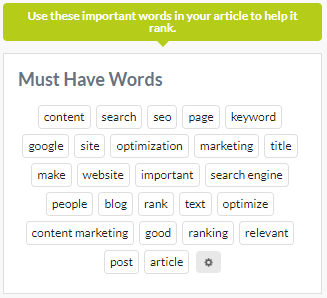 Finally, I scroll down to the article topics to see how keywords are grouped. In just 1 minute, I have a very good idea if not a solid article plan to fully answer the question… what is “content optimization for seo”. I have 2 very valuable things in front of me. What is your method for writing and planning your articles with SEO optimization in mind? If you love Google keyword tool or have a twist on the method, leave your comment below! I’d like to know.